The buzzwords in restaurants and the food industry these days are almost overwhelming. Catchphrases meant to draw consumers in are thrown around to the point of near irrelevance. I have always had some beef with the way that "natural" and "farm to table" have morphed (among other keywords and phrases) into very much meaningless adjectives. Is not most of the food we eat farm to table, in some sense? The food had to grow from somewhere after all. Well, in comes The North Left with their "Farm to Forage" dinners every week. Wait? It's not "farm to table" in the name? No, rather, these are dinners based on ingredients sourced from the farms and/or foraging whether via farmers' markets or from one's own foraging and growing means. Neat, we thought! Let's get some of that action! On July 2nd, we did just that (by invitation) and were blown away with the dishes we had that evening. A bit of background on the dinners themselves: these limited-seating, tasting menu style dinners are held once a week and allow Chef Aron Habiger and Pastry Chef Ashley Guzman to unleash their creativity in a one night throwdown between their dishes and your palate. Inspiration stems from the ingredients they are able to procure through farmers' markets and their own foraging. What helps is that The North Left also possesses its own rooftop garden from which they gather components as well! These "Farm to Forage" dinners surprised us also in their pricing - a mere $40 for three courses with bar pairings. A bit of a steal, no? The interior of the restaurant seemed very much to convey a location where having craft cocktails is the norm. Dark woods, blacks, and tufted faux leather seating gave us the vibe that "Farm to Forage" is not too unattainable a concept for the crew in store. 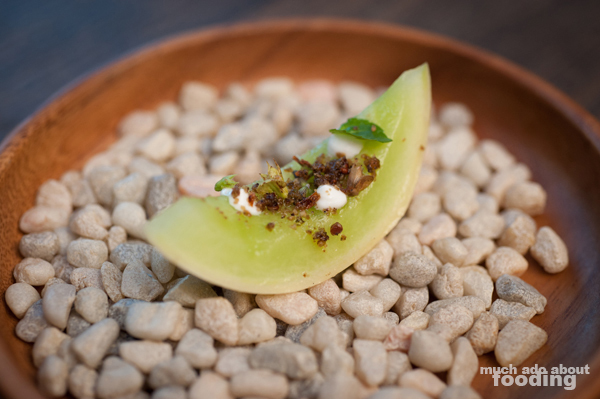 We began with the Amuse Bouche (Greek yogurt, honey glaze, rooftop garden honeydew melon, rooftop garden orange mint, and rooftop garden Thai basil), beautifully presented atop minuscule white stones. It had to be the smallest slice of honeydew I've ever seen but its origins from the rooftop garden made the size unsurprising. A quick, juicy bite finished off the amuse bouche which we found delightful for its sweetness paired with some fresh herbs. 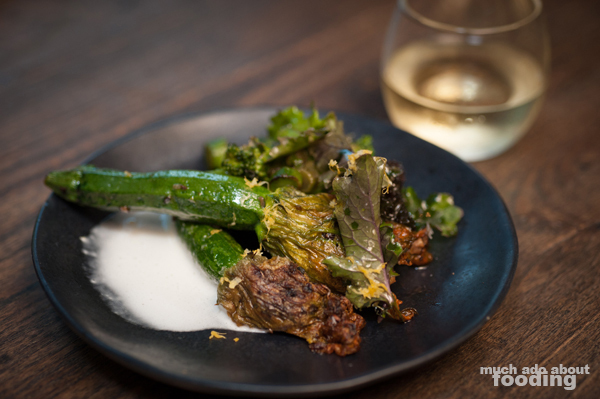 Course One was initially a shocker to me - the Squash Blossom was stuffed with Shiitake mushrooms and came with espuma cheese, broccoli rahb, and lemon zest. Why the shock? I rarely see squash blossoms done without cheese stuffed inside these days. There was the perfect balance of saltiness in this dish on both the outside and inside. I loved the brightness from the zest which distinctively shone its tangy fragrance. Paired with Crios Torrontes (Argentina) which played off of the frothy cheese and roasted vegetal flavors, the overall course was a fine introduction as to what would come. 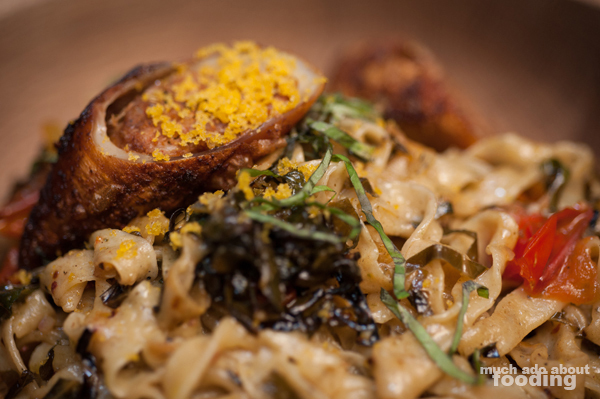 I found the mushroom stuffing to be the highlight of this dish as many other establishments veer towards the aforementioned cheese stuffing and deep-frying with a tempura batter; instead, Chef Aron gave a rich, umami-laden memory in our bites. The name for our Course Two was simply "Pasta" but we knew there was more. It showcased Electric City Butcher Sicilian-style sausage stuffed squid, Santa Monica collard greens, rooftop garden tomatoes and Thai basil, and shaved bottarga, paired with Austerity Pinot Noir (Santa Lucia). Throw a flat-noodle pasta in my face, and you know that I will devour it. 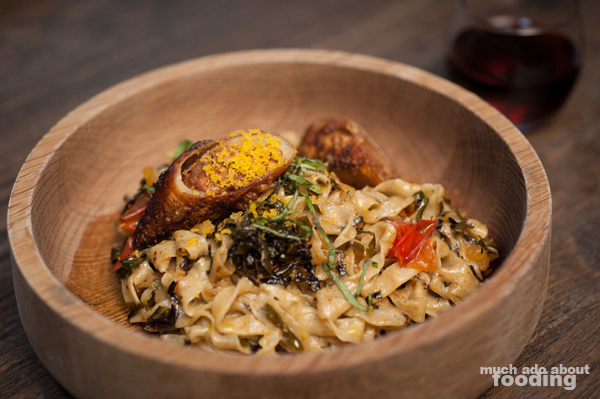 The handmade pasta was exquisitely soft and luscious, lending its smooth texture to contrast the bite in collard greens and juicy explosions of tomatoes. The stuffed squid was a bit difficult to chew on at first but overall, the dish was executed well. The evening ended with a surprising Dessert Course of Sweet Corn and Avocado Budino with warm strawberries. I really appreciated the thoughtfulness that went into ensuring every ingredient had a companion. 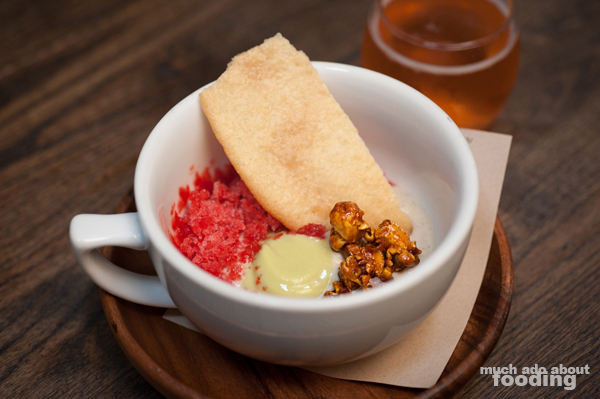 For example, the budino was a sweet corn flavor and accompanied by caramel popcorn for an extra emphasis on the flavor profile of corn as a whole. The strawberry granita and syrup was followed by macerated strawberries. Paired with a spicy strawberry jalapeno shrub and Cava, this delicate dessert was a satisfying mesh of flavors that were well thought-out and overall excellent. If you are interested in participating in these dinners that occur on Thursday evenings, note that they are just limited to 20 seats every time and reservations for them begin at 6PM. 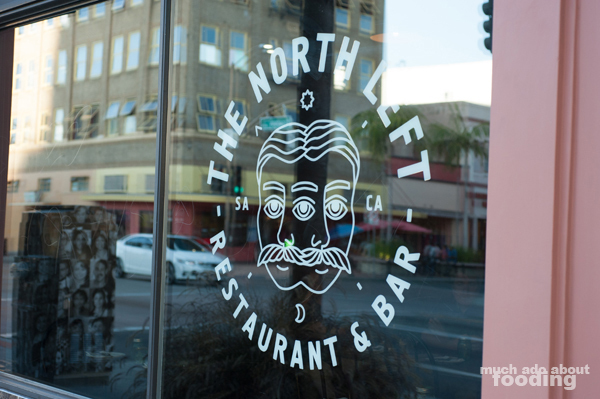 Find The North Left at 400 N. Broadway in Santa Ana.